Added by Bill Bowman on October 10, 2017. 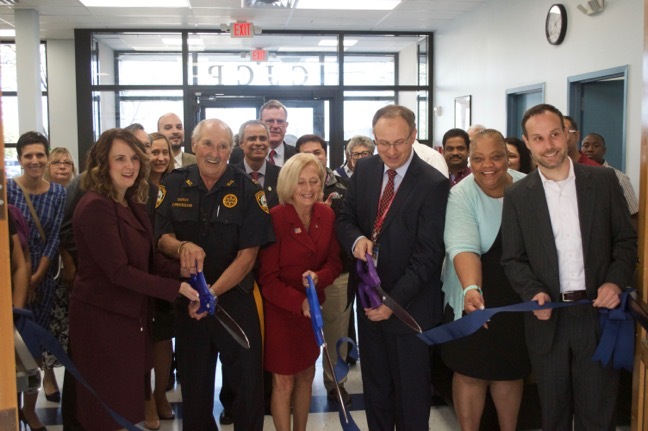 State Education Commission Kimberly Harrington, Somerset County Sheriff Frank Provenzano, Somerset County Freeholder Patricia Walsh and Namik Sercan, chief educational officer of Central Jersey College Prep, (left to right) cut the ribbon on the new school building. Faculty, staff and students at Central Jersey College Prep Charter School threw a little party for themselves Oct. 10, on the occasion of the grand opening of their new school building. The school, which for the past several years has been housed on Schoolhouse Road, has some more breathing room in its new digs at 101 Mettlers Road. The 93,000-square-foot facility boasts 96 classrooms, said Namik Sercan, the school’s chief educational officer. Sercan said the new building, with its expanded number of classrooms, will keep teacher-student ratios and class sizes low. “Addressing the educational needs of the students and families is the key to the social and economic well being of Central New Jersey and the entire Garden State,” he said. Sercan said the school is expected to hold 960 students by 2020. Among the township dignitaries attending the event were Somerset County Freeholder Brian Levine, Township Councilwoman Roz Sherman, Board of Education member Pat Stanley and BPU Commissioner Upendra Chivukula. “Central Jersey College Prep is a special place, providing the choice for parents where students’ dreams are believed in and the skills, qualities and personal experiences needed to pursue those dreams are nurtured,” Harrington said. “You are truly a village of parents, community members and staff working together to ensure each and every one of your students have the skills and qualities of character to be ready upon graduating from high school to have abundant choices and pathways by which to follow those dreams,” she said. CJCP alum Stephanie Quaye speaks to attendees at the school’s new building grand opening. 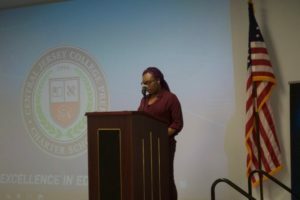 CJCP alum Stephanie Quaye, a freshman at Cornell University in New York City, told the group that it was her education at CJCP that allowed her to attend Cornell. “I’m happy to see the school expand, and I am excited for the new students that they are able to accept only because I know that they are in great hands,” she said.